In this study, chemical sensors with polyaniline films were produced and used in a sensor array (electronic nose) to detect the volatile compounds of artificially flavored gummy candies during storage. The polyaniline sensors were obtained by the in situ polymerization technique on graphite interdigitated electrodes (PGIEs) using tracing paper as substrate. The moisture, water activity, and physical and thermal properties of gummy candies artificially flavored with apple, strawberry, and grape remained constant during 120 days of storage. The camphorsulfonic acid–doped sensor showed the highest sensitivity to the apple and strawberry aromas and the one with HCl to the grape aroma. It was observed a decrease of the sensors responses during the gummy candies storage period, which is related to the aroma loss. By principal component analysis (PCA) the sensor array used in the electronic nose system were highly efficient in discriminating the different storage times of the gummy candies. 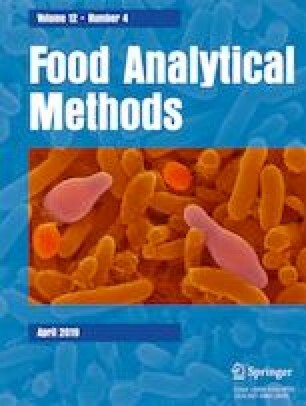 The characterization of polyaniline films doped with different acids demonstrates small changes structure that caused significant changes in the sensitivity of the sensors upon exposure to gummy candy’s volatiles. This e-nose is cheap, reliable, can be easily operated, and is one tool for detecting gummy candy’s volatiles, helping the food industries evaluate stability of food matrices. The authors received financial support from Cnpq, Capes, Fapergs, and Finep. Sandra Cristina Ballen declares that she has no conflict of interest. Adriana Marcia Graboski declares that he has no conflict of interest. Alexandra Manzoli declares that she has no conflict of interest. Juliana Steffens declares that she has no conflict of interest. Clarice Steffens declares that she has no conflict of interest. A statement regarding informed consent is not applicable for this study.